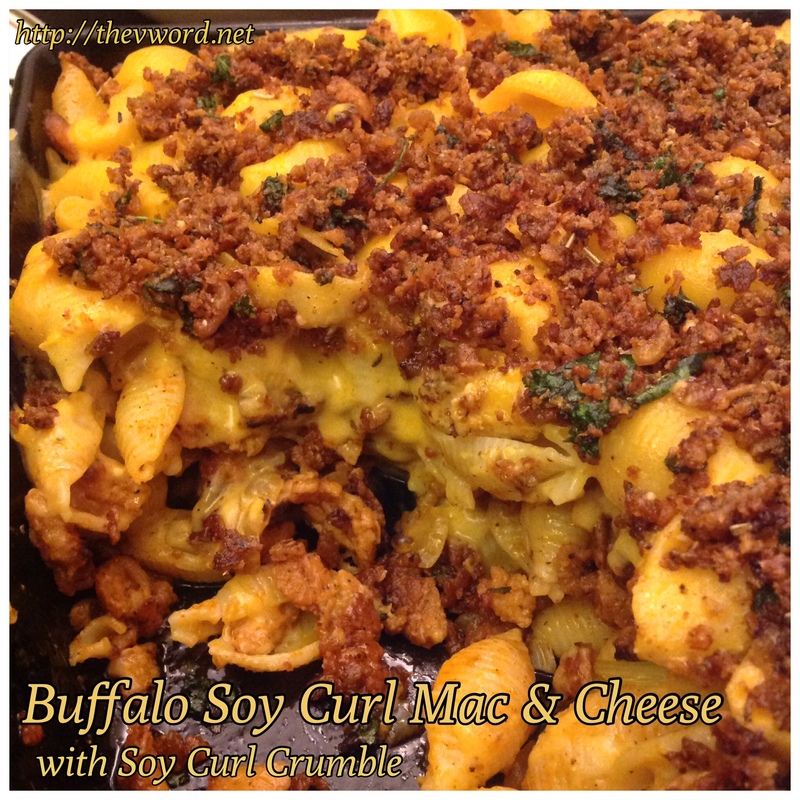 This recipe is my Ode to Soy Curls. Mayordomo de soja Rizos are one of my favorite products. I remember the first time someone told me about them – she warned me they were addicting. Bien, I have been hooked for years. 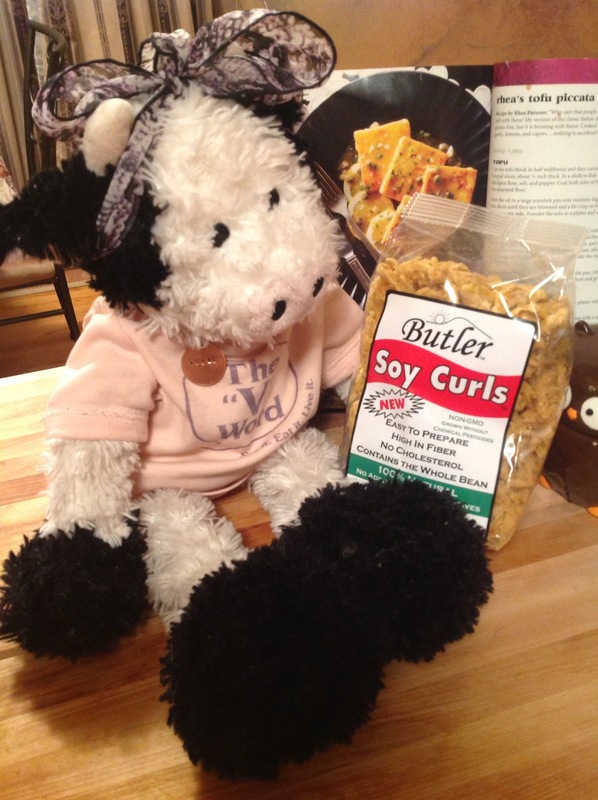 Soy curls are one of the most versatile products out there. You can make so many different things with them. Hasta la fecha, I have made dozens of recipes and many of those are here on the blog including my Jamaican Jerk Soy Curls, Rizos Buffalo soja, Vegan Orange Soy Curl Chicken, Jamaiquino (Bebida) Soja Rizos Curry con Broccoleaf, Jamaican Soy Curls in Curried Tomato Cream Sauce, Vegan Soy Curl Caesar Salad, Skillet Cheesy Enchilada Stew, Vegan Chicken Paprika with Wide Noodles and Kale, Homemade Calzones, Vegetariano “Pollo” Escabeche, y Yum-O Pila de agua bendita. If you have ever ordered a case of Mayordomo de soja Rizos (y que debiera), at the bottom of the mound of soy curls (24 bags worth) there are a lot of crumbs. When I saw all those crumbs, I wondered what to do with them. I didn’t want to throw them out or waste them. 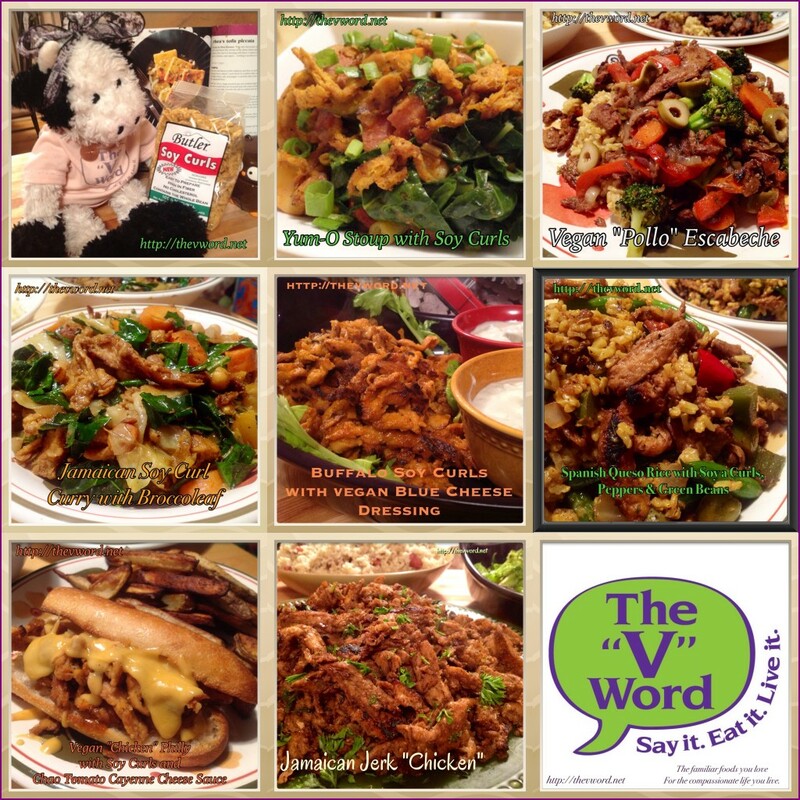 The crumbs are fine like bread crumbs and then it hit me…use them like bread crumbs! 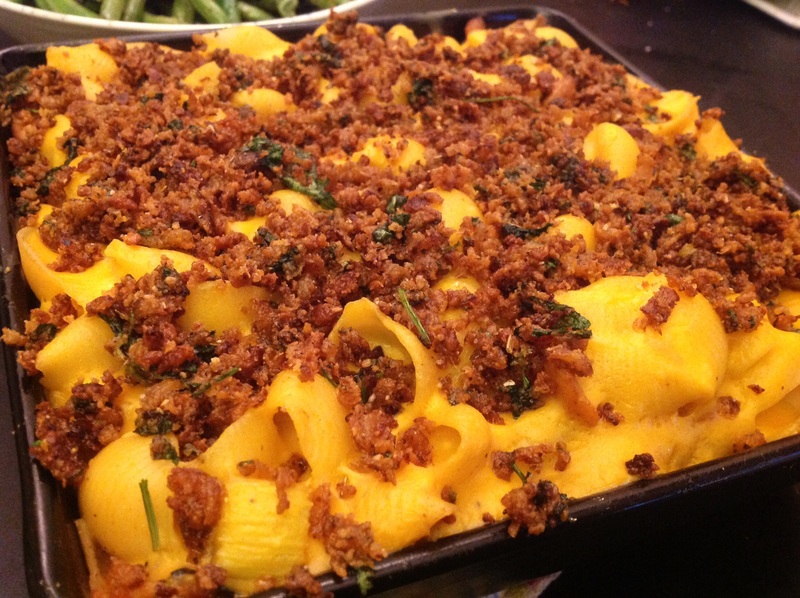 I asked Tom, “How would you like me to make mac and cheese?” That’s one of his favorites. 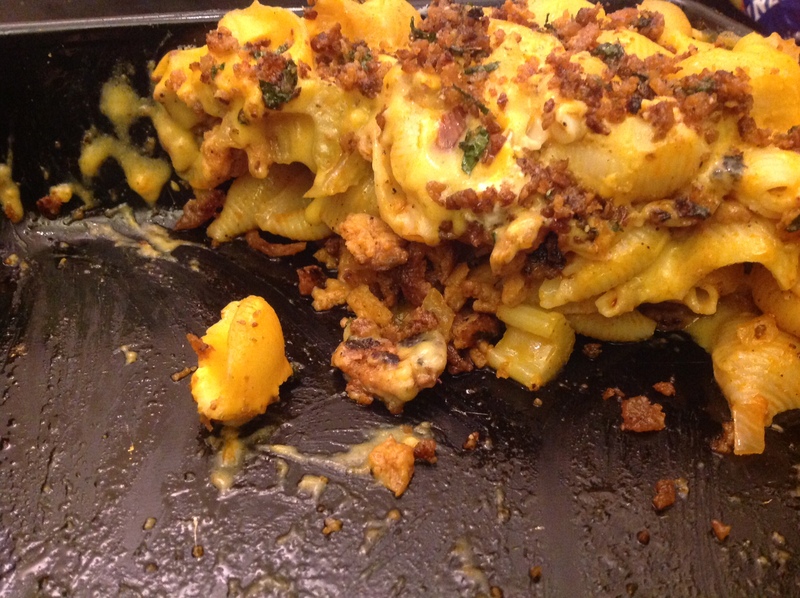 Then I added, “How about a soy curl mac and cheese?” Even better. “How about a Buffalo soy curl mac and cheese?” It couldn’t get any better than that or could it? 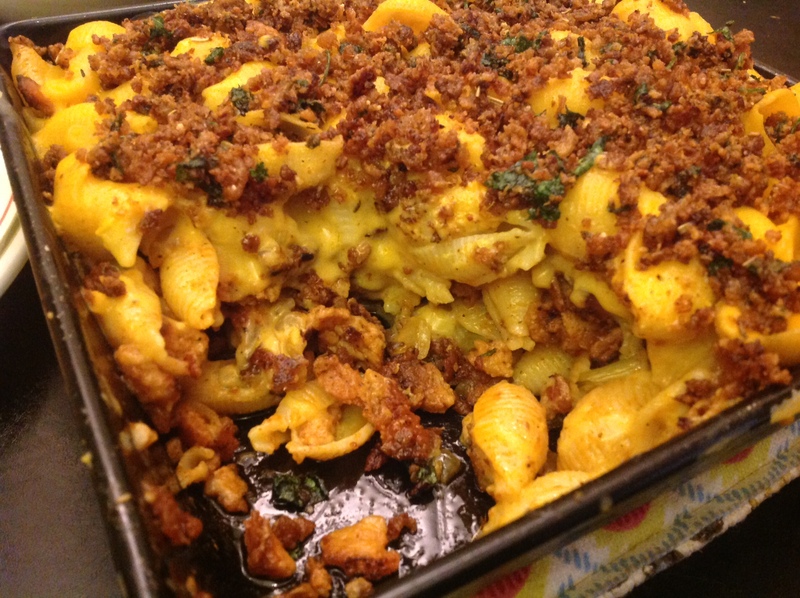 “How about,” Pregunté, “using the soy curl crumbs as the crumble topping instead of bread crumbs?” It was genius! I made a cheese sauce using Earth Balance Vegan Buttery Spread y Daiya Cheddar Shreds. I added hot sauce to make it a Buffalo sauce and some Tofutti Better than Sour Cream to cool it down but that part is totally optional. If you don’t want it too hot, you can make either the cheese sauce OR the soy curls Buffalo-flavored rather than both, or not at all but it’s really good. When it came out of the oven, bubbling with ooey-gooey goodness, it was really hard to wait the 15 minutes to let it set. Then we got to eat it. OMG! Spicy, cremoso, crunchy and oh, tan bueno! 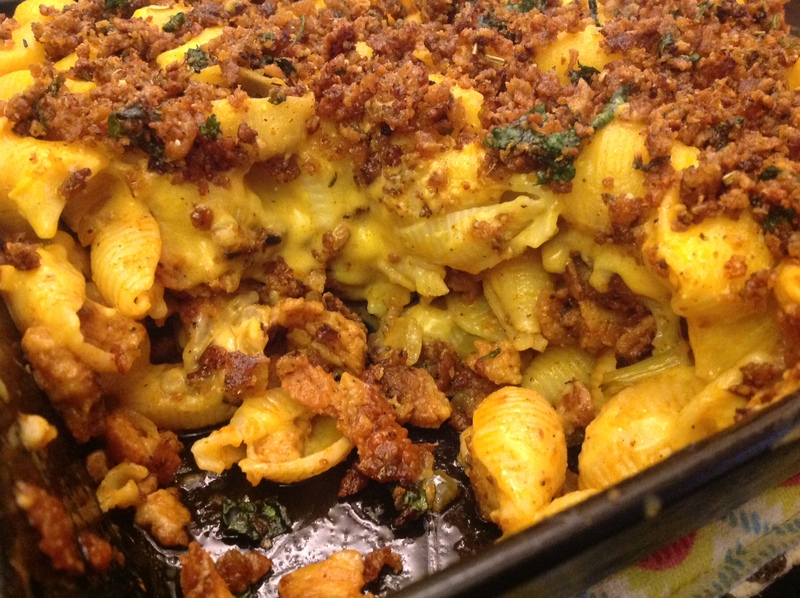 The shells really picked up the sauce and the crumbles. There were moans and groans everywhere. 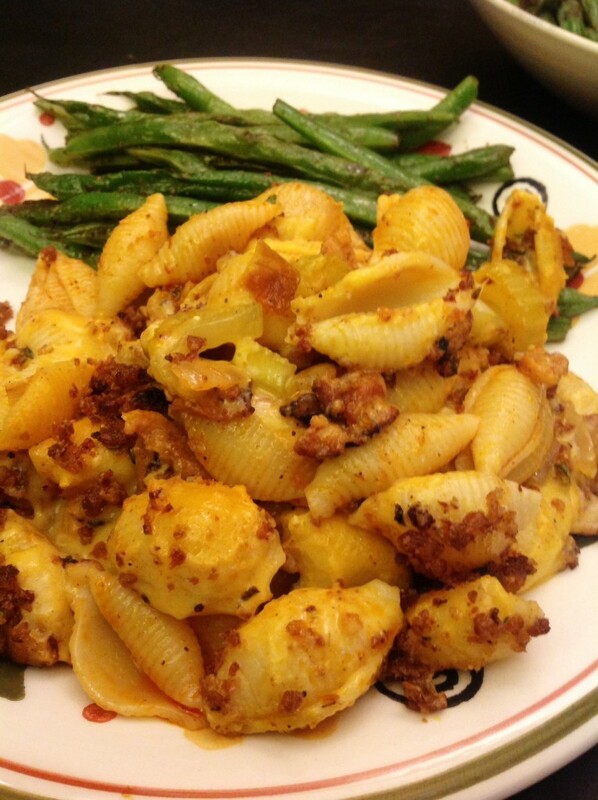 We had the mac and cheese with some quickly sauteed green beans. Yum! Sí., soy curls topped with soy curls was a great idea. Now I’m planning to use the rest of the crumbs other ways such as using them for the binder in burgers rather than bread crumbs or flour. We’ll see how that goes. If you love Mayordomo de soja Rizos as much as I do, you NEED to make this recipe. If you’ve yet to experience the glory of soy curls, now is a great time. 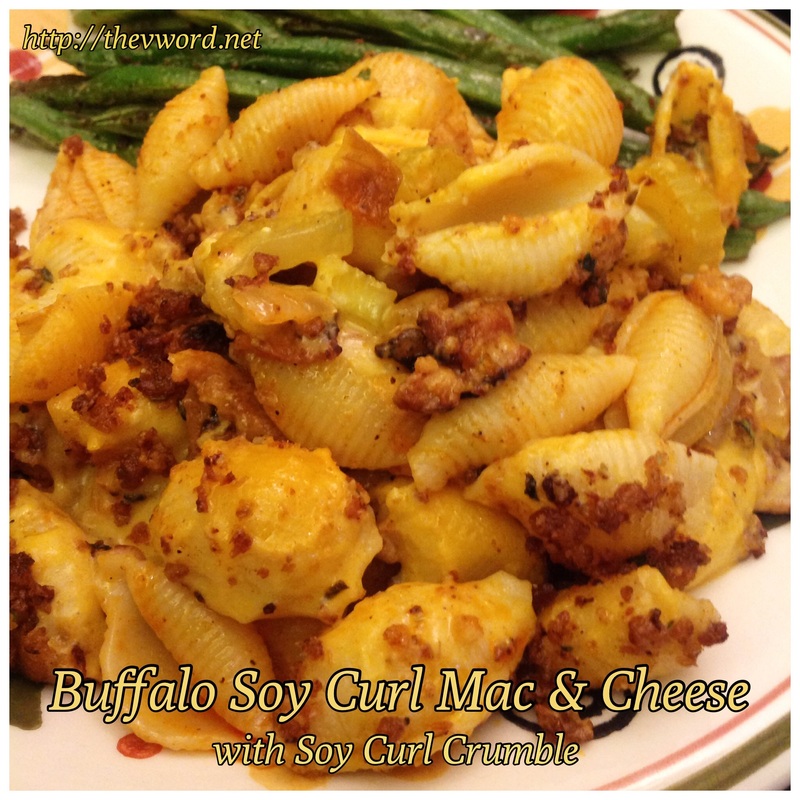 You will love this Buffalo Soy Curls Mac & Cheese with Soy Curl Crumble. Disfrutar! Empty the bag of soy curls and the soy curl crumbs into separate bowls and cover each with hot water. Dejar reposar durante 10 minutes until the soy curls are softened. Drain each separately and gently squeeze out any excess liquid. Pat dry and toss to coat the soy curls and the crumbs with the seasoning. Calentar el aceite en una sartén a fuego medio-alto. Cook the soy curls until browned and crisp, acerca de 8 acta. Add in the onion and celery and cook for 4 minutos hasta que las verduras se ablanden. Add in the hot sauce and toss to coat. La transferencia de los rizos de soja a un tazón y reservar. En la misma sartén, heat more oil and cook the soy curl crumbs until browned, acerca de 7 acta. Pasar a un tazón y reservar. Bring a large pot of water to a boil. Add a handful of salt and the pasta to the pot. Stir and let cook until shy of al dente, acerca de 12 minutes depending on the pasta. Keep ¼ cup of the starchy cooking liquid just in case. Drain the pasta and put it back in the pot. En una cacerola mediana, derretir la mantequilla vegana a fuego medio. Whisk in the flour and mustard powder until it has formed a roux. Let cook for one minute. Slowly add in the milk and whisk until thickened, acerca de 3 acta. Sazonar con ajo en polvo, turmeric and hot sauce. Melt in the cheese and then turn off the heat. Whisk in the sour cream. Adjust for taste – if it’s too spicy, add more sour cream. Precaliente el horno a 350 grados. Add the Buffalo soy curls to the pot with the pasta and toss to mix. 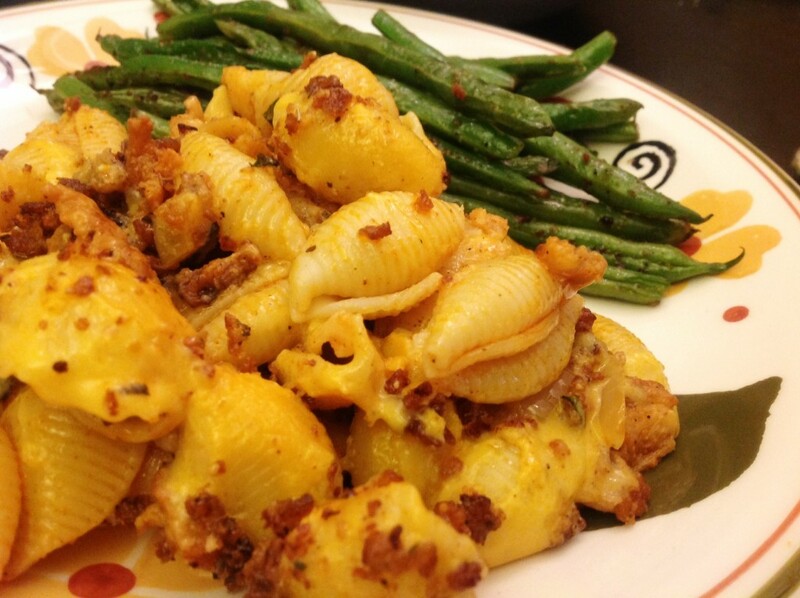 Pour in the cheese sauce and toss to coat the pasta and soy curls. Transfer the mix to an oiled baking dish. Pour the melted butter into the soy curl crumbs and add the parsley. 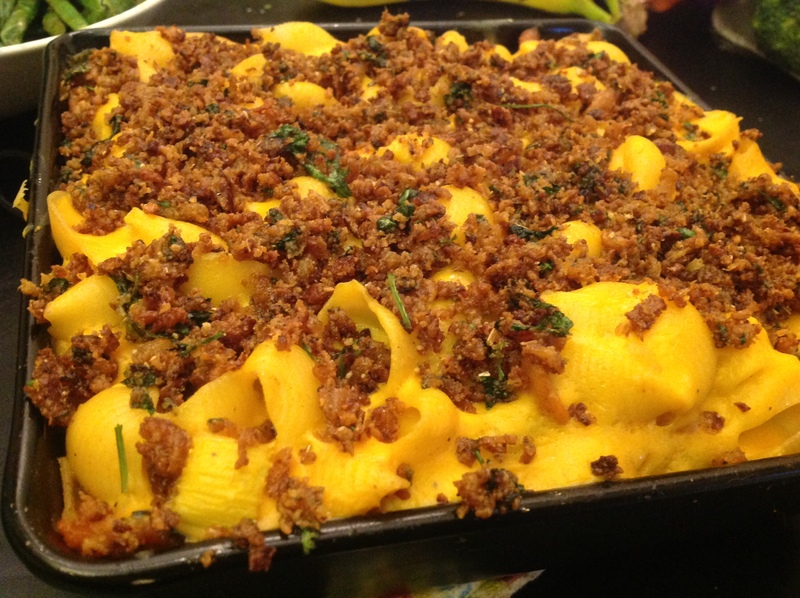 With your fingers, squeeze the crumbs incorporating the butter. 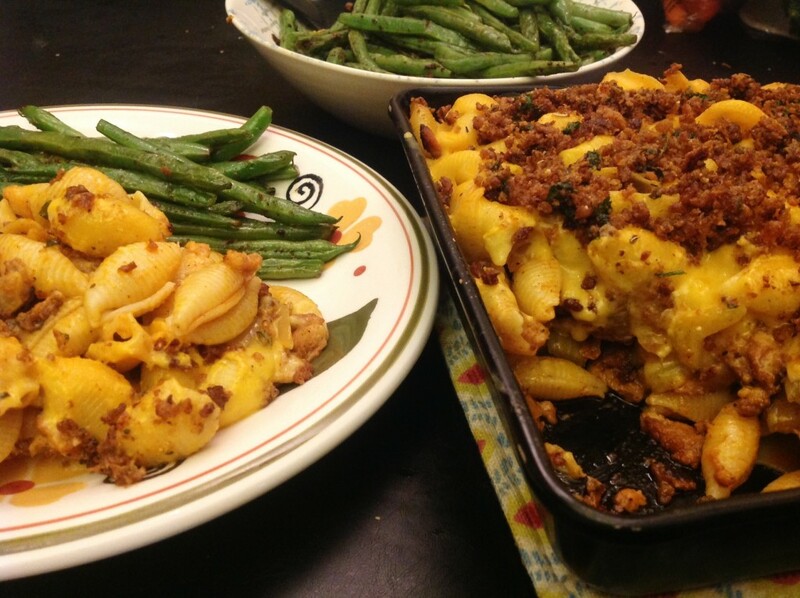 Sprinkle the top of the baking dish with the soy curl crumble. Hornear durante 20 minutes until the cheese is bubbling. Remove from the oven and let stand for 10-15 minutes before serving. En una cacerola mediana, derretir la mantequilla vegana a fuego medio. Whisk in the flour and mustard powder until it has formed a roux. Let cook for one minute. Slowly add in the milk and whisk until thickened, acerca de 3 acta. 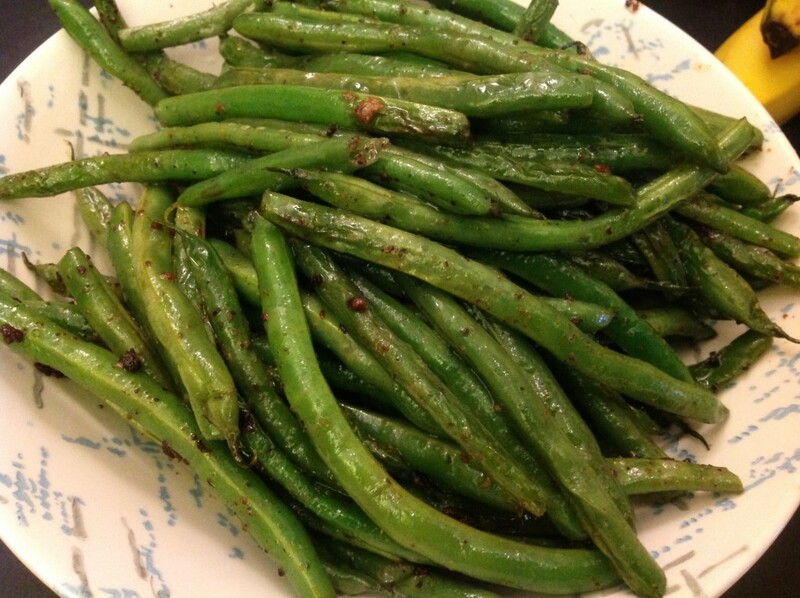 Season with garlic powder and hot sauce. Melt in the cheese and then turn off the heat. Whisk in the sour cream. Adjust for taste – if it’s too spicy, add more sour cream. Definitely going to make this. Gracias por la receta. Gracias Allison. Espero que os guste!